Sound as an artistic medium, in a way, is an overused one. Since ancient times, sound has been explored as a means of expression in numerous forms of what we call music. In today’s modern world, various kinds of musical sound permeate our lives on TV, radio, streets, and in our homes. In fact, our environment is so saturated with them that we, consciously or not, choose to ignore what we hear. As the visitors walk into the gallery, they encounter an abstract image of what looks like a chromatographic study diagram projected on the floor. The main piece of this installation, though, is not what you see; it’s what you hear. And what you hear is created by the noise you make. Several microphones are placed throughout the gallery space. Those microphones pick up whatever sounds are in the room: visitors talking and laughing, cars on the streets, ambient noises in and around the building. These sounds are collected and fed to various computer software engines (constructed in MAX) that analyze them. The different results of the analysis are then played back through several speakers around the room. This is a system that “recycles” audio data on the fly. Depending on the setting of the installation, the number of audience members, and the amount of ambient noises, it creates varying results. 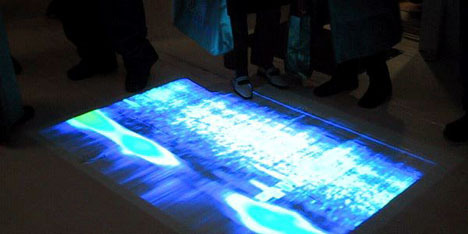 The image project onto the floor is a visualization of diverse sound waves produced by the software (when there weren’t too many visitors in the gallery, the image that was projected on the floor was fairly monochromatic). What the visitors hear at a given moment is actually unique and is never the same because their presence is a direct contribution to the whole piece. RE.SOUND is definitely an interesting attempt. It relies on user’s input. Thus, it is an interactive piece. It is a good example that proves that there is more to interactivity than just clicking on a mouse.